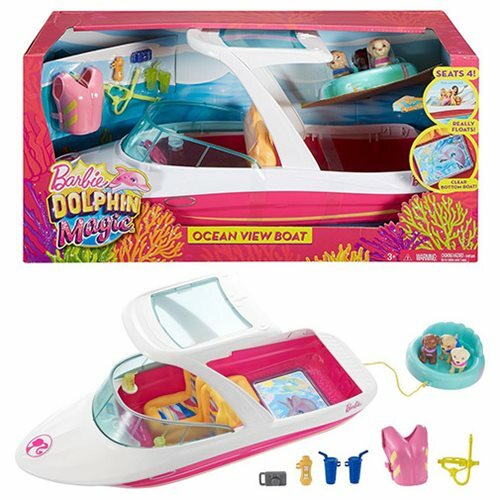 Dive into an ocean of fun with the Barbie Dolphin Magic Ocean View Boat inspired by Barbie and her sisters' tropical adventure. It's ready to make waves with cool features, three puppies, and lots of accessories to recreate the action. Designed in pink, white, and yellow, the sleek vessel really floats and comes with a raft for the puppies. It stays afloat, too! Fold down the canopy to seat Barbie and all her sisters (dolls sold separately). There's room on the boat for four dolls. They'll love looking through the "glass" bottom that reveals underwater sea life, like a cute dolphin rising to say hello. Attach the blue raft by the cord to give the puppies a fun ride! Ages 3 and up. Additional accessories expand the storytelling opportunities. A life vest and snorkel mask for the doll make a splash. Two drink cups, a bottle of sunscreen, and a camera add to the tropical fun. Fans will love recreating scenes or telling their own tales above and below sea level! Collect all the dolls and accessories from the Barbie Dolphin Magic line (each sold separately). The boat includes a canopy and "glass" bottom, three puppies, a floating raft with cord attached to boat, and themed accessories. Colors and decorations may vary.